Today it’s time for a leisurely Saturday lunch in the heart of Soho. How I love Soho with its myriad bars and restaurants, food stalls, stylish people and quirky shops. After much consideration we picked Bocca di Lupo as today’s lunchtime venue. 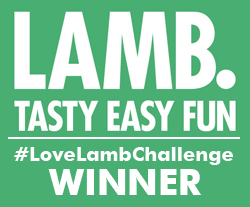 It opened in November 2008 and has become a firm favourite on the Soho restaurant map. The restaurant is dominated by a long welcoming bar that runs down its length. And we managed to nab top seats – at the end of the bar alongside the window. From our prime position we overlooked the drinks pouring activity, which made it impossible to resist that Italian classic – a Bellini. This delicious cocktail, made of Prosecco and white peach puree or nectar, was invented sometime between 1934 and 1948 by Giuseppe Cipriano, the founder of Harry’s Bar in Venice. 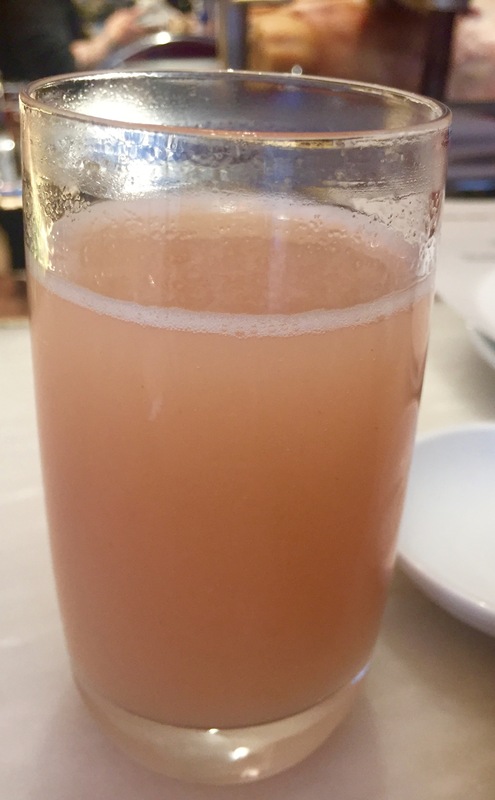 He named it a Bellini because of its unique pink colour which reminded him of the toga of a saint in a painting by 15th century Venetian artist Giovanni Bellini. It looks stunning and tastes even better! What a good start to lunch. Sipping on our Bellinis we pondered the delightful menu options – a wide range of regional Italian food and wine from all over the country. And you can choose small or large portions for most of the dishes. 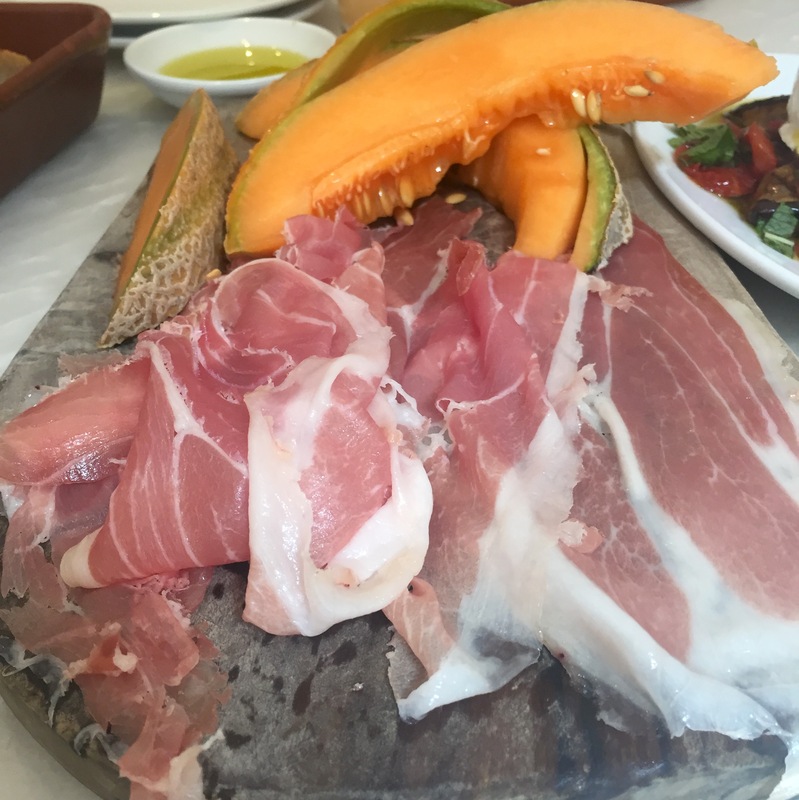 We also overlooked a luscious leg of Parma ham ready for slicing and were soon feasting on a platter of the thinnest of tenderly sweet meat served with amazingly juicy orange melon. A simple, classic dish made perfect by the most fabulous of ingredients. 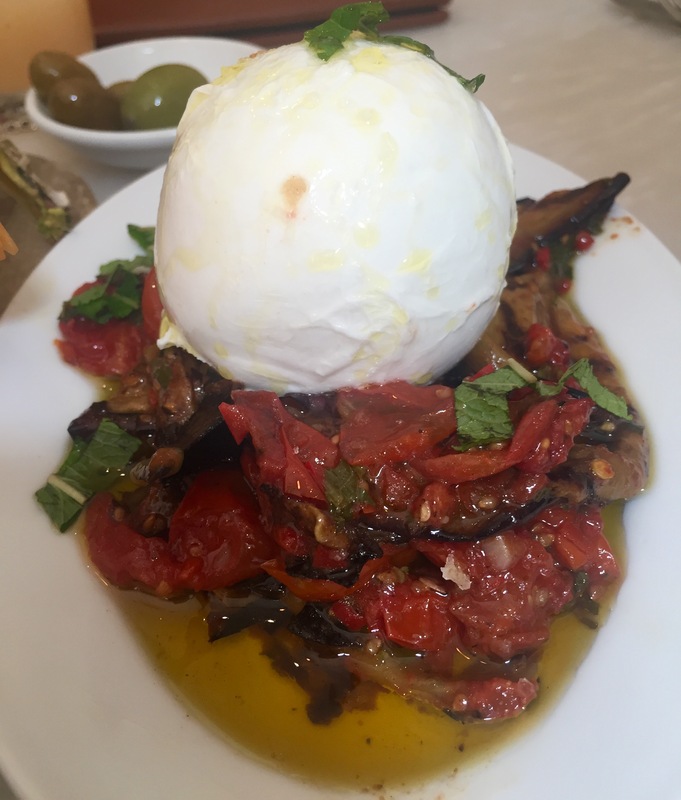 A creamy ball of mozzarella sits atop beautifully thin marinated and grilled aubergine, tomato and chilli. Vegetables don’t get more intensely flavoursome than this, and combined with the cheese and olive oil it’s again a masterpiece of simplicity and taste. There’s a section called Fritti – which means fried. Here you can order a range of fried morsels and you can order them individually – they’re a couple of mouthfuls each. 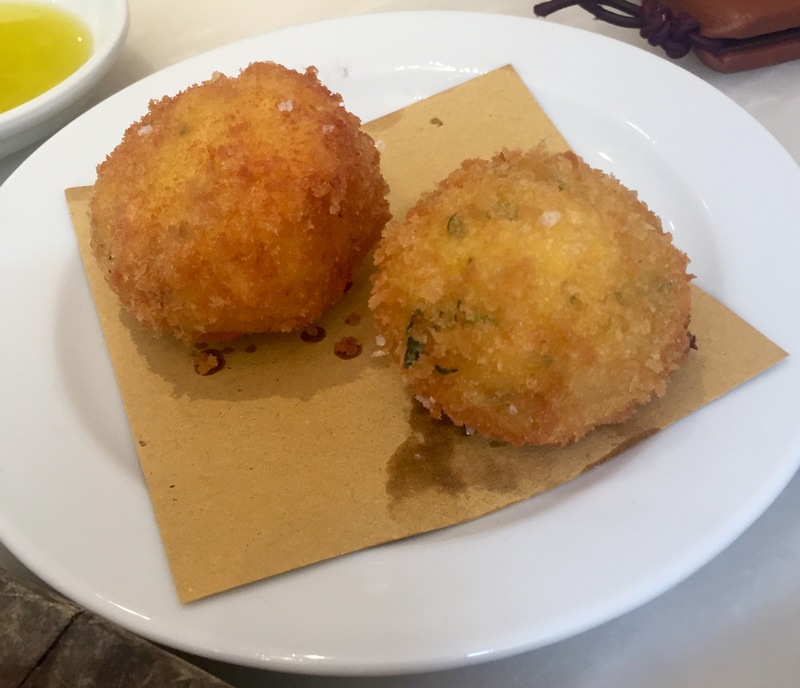 We tried the saffron, bone marrow and gremolata mini arancino – classic Milano risotto surrounded by a delicately crispy crumb. 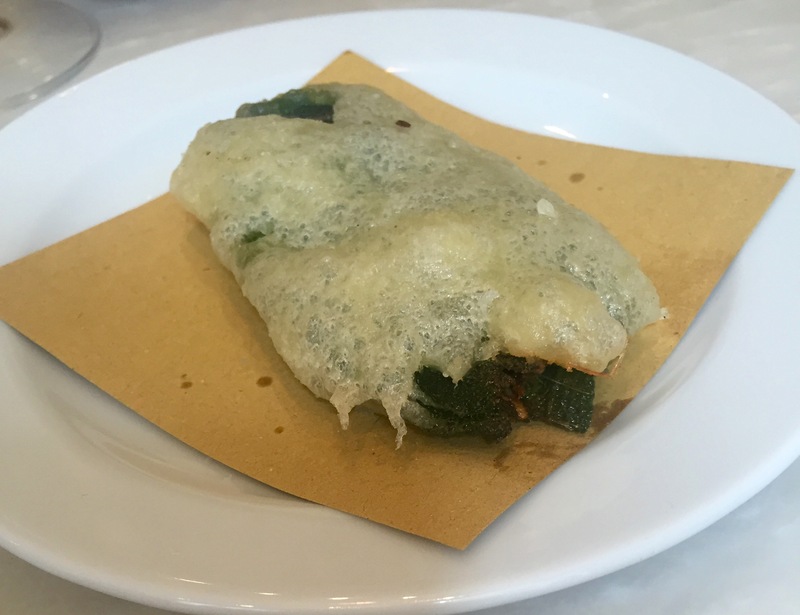 And here’s a sage leaf filled with anchovy, battered and fried. One of my favourite mouthfuls ever. There’s a range of pasta dishes on offer, we selected to have two small portions. First up nettle pappardelle with duck ragu. 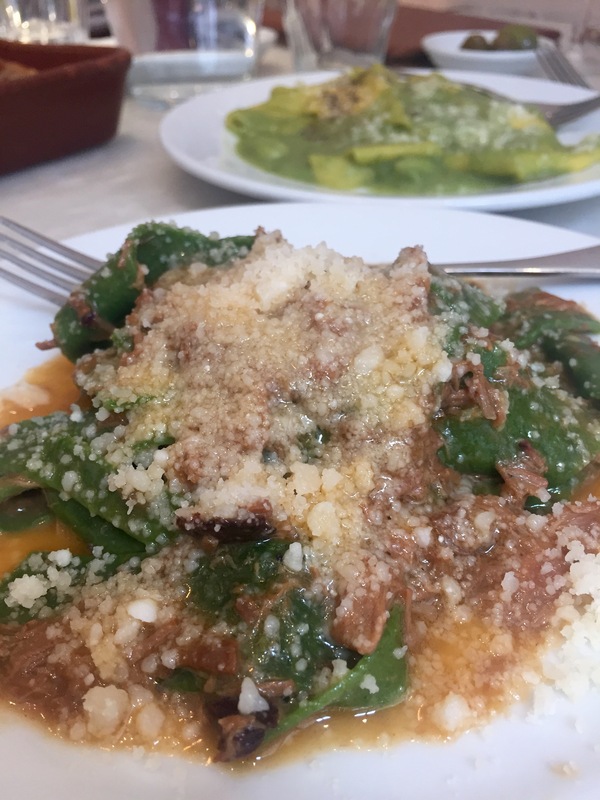 Vibrant green ribbons appeared smothered in melt-in-the-mouth duck ragu. 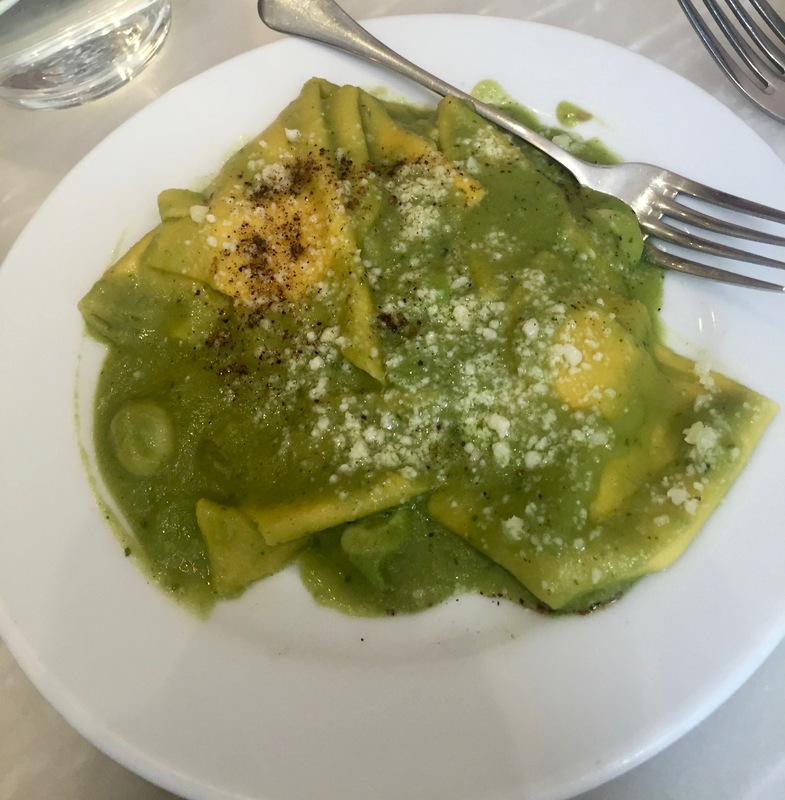 The fazzoletti came with broad beans, their puree and pecorino. This is a miracle of simplicity with the thick, rustic handkerchief pasta covered with the silken sweetness of broad bean puree and a cheesy finish. Bread and olives are delivered to your table while you’re pondering menu choices. 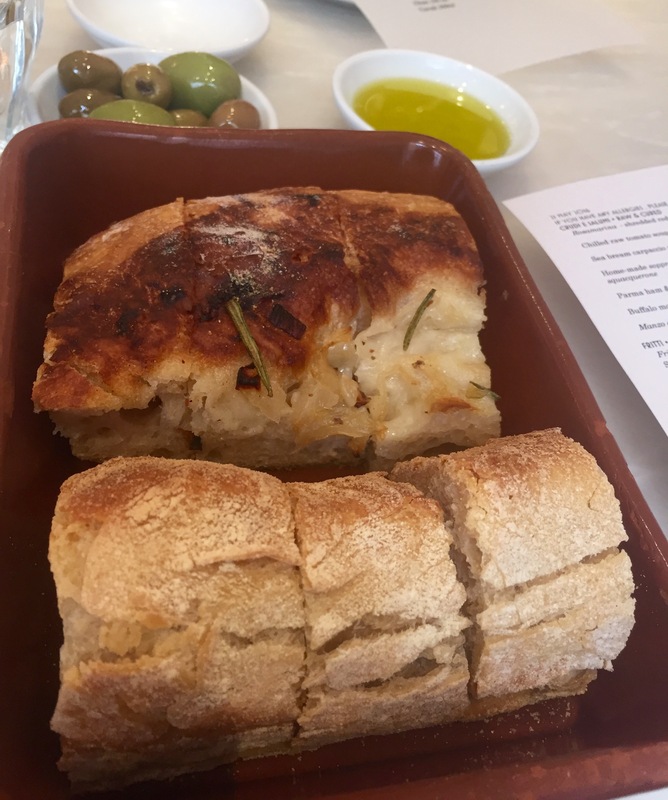 Deliciously warm, soft onion-topped bread, shiny olives and olive oil with a fresh and spicy bite. I love the bar at Bocca di Lupo. Get there early like us and nab the corner seats by the window. You’ll find it hard to tear yourself away. Well, I always do. I’ve had requests to include a guide to menu prices in my posts, so I’ll include my price point at the end of each post. If there’s anything else you’d like to see do let me know, I am here to help after all. Lunch for two cost £100 including 2 Belllinis, a bottle of white wine and service. Pasta dishes cost from £8 for small plates to £20 for large plates. Items on the fritti section cost from £1.50 to £4.50 each. 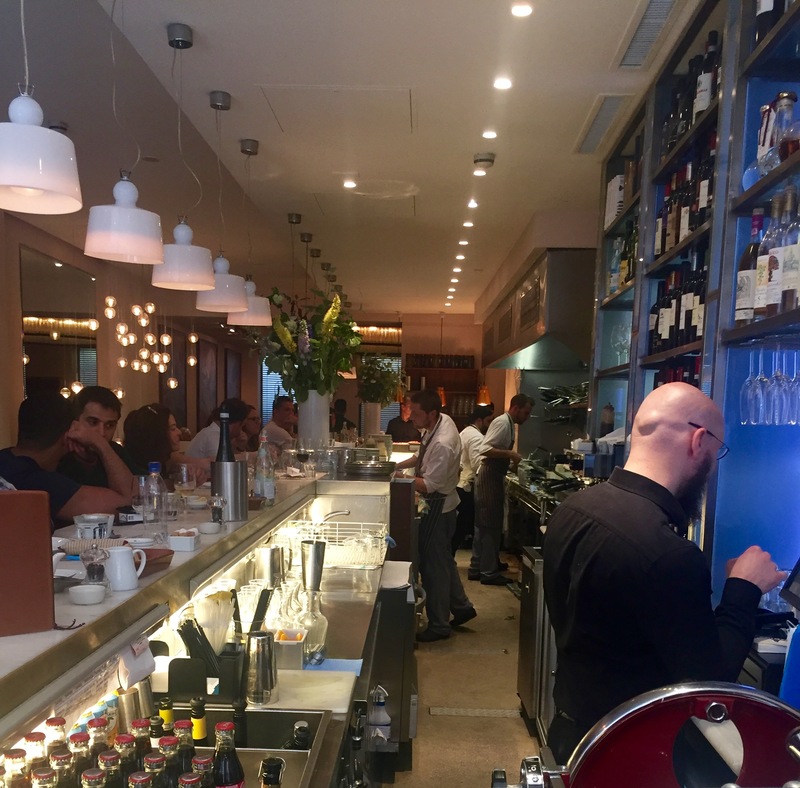 Bocca di Lupo is at 12 Archer Street, W1.